Collections framework was not a part of original Java release. Collections was added to J2SE 1.2. Prior to Java 2, Java provided adhoc classes such as Dictionary, Vector, Stack and Properties to store and manipulate groups of objects. 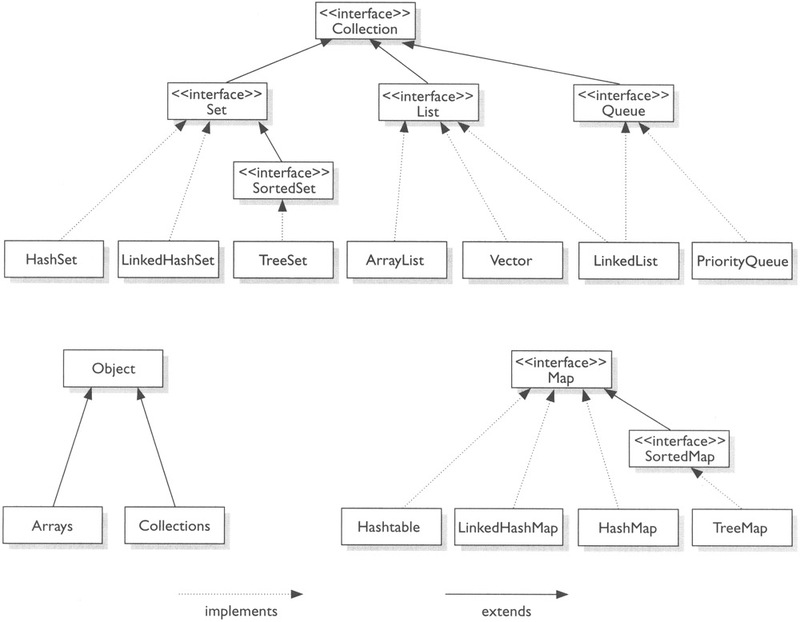 Framework in java means hierarchy of classes and interfaces.Collections framework is contained in java.util package. It provides many important classes and interfaces to collect and organize group of alike objects. Deque Extends Queue to handle double ended queue. List Extends Collection to handle sequences list of object. Queue Extends Collection to handle special kind of list in which element are removed only from the head. Set Extends Collection to handle sets, which must contain unique element. SortedSet Extends Set to handle sorted set. All these Interfaces give several methods which are defined by collections classes which implement these interfaces. Why Collections were made Generic ? Generics added type safety to Collection framework. Earlier collections stored Object class references which meant any collection could store any type of object. Hence there were chances of storing incompatible types in a collection, which could result in run time mismatch. Hence Generics was introduced through which you can explicitly state the type of object being stored. We have studied that Autoboxing converts primitive types into Wrapper class Objects. As collections doesn't store primitive data types(stores only refrences), hence Autoboxing facilitates the storing of primitive data types in collection by boxing it into its wrapper type.